LED light therapy is a new treatment that uses carefully calibrated LED lights to treat skin conditions such as acne and to reduce the visual effects of ageing. Unlike sunbeds, which can have a harmful and ageing effect on the skin, LED light therapy works with your body to give you brighter, younger-looking skin. It can be used to treat and soothe many skin conditions, as well as increasing the speed of healing after other treatments. What Conditions Can LED Light Therapy Help With? LED Light Therapy can help to treat many different conditions including acne, rosacea and psoriasis. It helps to lighten and balance out reddened or inflamed areas of skin. Because it boosts the body’s natural healing abilities, it can speed up healing after skin treatments. These treatments, such as micro-needling or dermabrasion, are used to treat many different conditions and will be aided by LED Light Therapy. 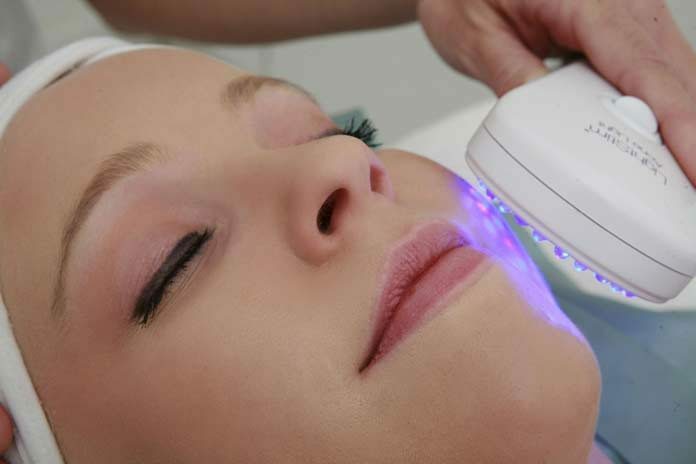 LED Light Therapy can be used to help acne and spot-prone skin. It increases the healing rate of skin after acne treatments, as well as killing acne-causing bacteria on the skin. It can also help reduce the appearance of ageing by increasing hydration in your skin and increasing collagen production, making your skin look plumper and smoother. It is a simple, painless way to treat tired, grey and sagging skin, leaving you with a rejuvenated, brighter and younger complexion. It improves skin tone and revitalizes tired or dull complexions, along with strengthening and repairing skin. What Does LED Light Treatment Consist Of? Coming in for an LED light treatment is simple. All you need to do is relax under specially-tuned LED lights for around half an hour. This allows the clinically proven wavelengths of light to improve your skin texture, colour and appearance. Although you will notice the effects after a single treatment, the results are cumulative. A regular course of treatments will have optimal results, with maintenance treatments helping your skin to improve permanently over a long period. How Does LED Light Treatment Work? LED Light treatment uses clinically-proven wavelengths of light, delivering controlled levels of red, blue and near-infrared to your skin. These are delivered to your skin in safe, therapeutic doses to stimulate skin rejuvenation and help to resolve skin issues. These wavelengths of light energise cellular functions, stimulating healing and other therapeutic effects. Our living cells are influenced by the light they absorb. Some forms of light, particularly UV, can be damaging in high doses. You should always make sure that you stay hydrated in hot weather and wear sunscreen every day. Light can also be beneficial, however. Light helps your body to create vitamin D and serotonin as well as reducing inflammation and preventing tissue damage. These wavelengths needs to be carefully optimised before treatment to ensure they produce the right results. Richard is the founder of BeauSynergy, a skin care clinic offering beauty skin treatments in St Albans. Winners of the What Clinic 2016 award, BeauSynergy provide first-class non-surgical skin treatments to give their clients rejuvenated, younger looking skin.